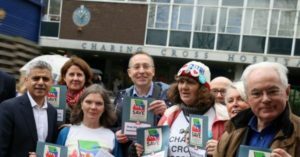 Huge victory for local campaigners as plans to close Charing Cross Hospital and further downgrade Ealing Hospital have been stopped. Yesterday Monday 26 March, Health Secretary Matt Hancock announced that the proposed plan, ‘Shaping a Healthier Future’ in NW London, which has been opposed by campaigners for the last 7 years has been halted. This has been a long and hard fought campaign by local activists and national organisations like Keep Our NHS Public. The years of tireless and determined campaigning by Hammersmith & Fulham and Ealing residents, Save Our Hospitals Hammersmith & Fulham, Ealing Save Our NHS, Hammersmith & Fulham Labour Council, Ealing Council and Labour MP Andy Slaughter, should be an example to all that campaigning does work and that tenacity can be rewarded. It has however, not been a bloodless fight. Ealing Hospital has suffered cruel and heartless cuts, with its children’s A&E, its maternity ward, and urology departments all shut down. In what will justifiably be seen as a victory for NHS campaigners, Matt Hancock said that NHS England ‘no longer supports’ the plan. Shaping Healthier Future was the biggest hospital closure programme in the history of the NHS with the loss of two major hospitals… abandoning Shaping Healthier Future is a victory for the people of Hammersmith, Save Our Hospitals campaigners and for our Labour Council. This is a moment for health campaigners to celebrate but also to remember that millions of pounds have been wasted, many cuts and closures have gone through, not to mention the 7 years of uncertainty for residents. It means that now is not a time to roll up banners, dismantle placards or disband local campaigns. We must remain vigilant and build on our successes; Our NHS is still under threat of more cuts and privatisation, as evidenced by the growing scandal around cancer treatment privatisation in Oxford. This victory should inspire us to increase our campaigning with the knowledge that we can and will win. 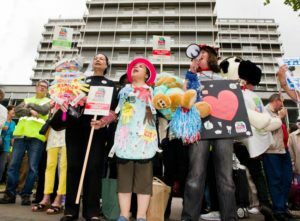 Ministers have axed plans to demolish and sell off most of a west London hospital after a seven-year campaign against a “monstrous” shake-up of NHS care in the capital. The reprieve means that Charing Cross hospital in Fulham will not lose its A&E unit and hundreds of beds under a scheme to downgrade it to a “local” hospital and sell 87% of its site for housing. Ealing and Charing Cross Hospitals’ A&E units had been expected to close as part of a programme to overhaul health services. But Mr Hancock said the Department of Health had withdrawn its support for the scheme after seven years. Campaigners welcomed the move but said it should have come sooner. The local NHS group said it had already spent £43m on consultants alone for the £500m project, Shaping a Healthier Future (SaHF). Today in parliament the Secretary of Health Matt Hancock announced that the closure plans for both Charing Cross and Ealing hospitals contained in the cuts & closures plan known as Shaping A Healthier Future have been withdrawn We’ve won. Its not been easy taking on a well funded posse of spin doctors, management consultants and political ideologues but many thousands of people have done just that and after a 7 year fight we’ve stopped a closure plan that was downright dangerous. Everyone has done their bit whether that’s signing petitions, challenging bureaucrats in meetings, running street stalls , demonstrating, fundraising or delivering & displaying posters. Tonight we should feel really proud of ourselves and celebrate our collective achievement. So we’ll have to keep campaigning – we’ve proven today that campaigning works. But for tonight let’s just celebrate a victory won by lots of different people (including you) working together to Save Charing Cross Hospital. Former NHS England chief executive Sir David Nicholson had called these plans “the most significant reconfiguration project in the country”. But since they first announced SAHF plans to cut nine major hospitals in North West London down to five, Ealing Save Our NHS has been campaigning against it side by side with many others including Save Our Hospitals Charing Cross and the Councils in Ealing and Hammersmith & Fulham. SAHF spent tens of millions of pounds of NHS cash on management consultants. All for nothing. Now Secretary of State for Health, Matt Hancock, has announced the Department of Health no longer supports it. 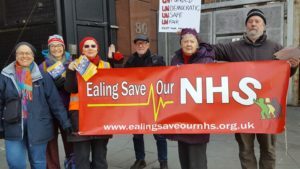 Ealing Save Our NHS has distributed a quarter of a million leaflets, held protests, attended carnivals, organised parties, lobbies, petitions, car convoys and much more to spell out the truth. On the other side huge amounts of NHS money was spent on public relations staff and glossy leaflets to pretend that our health would mysteriously be improved if they closed A&E’s and hundreds of beds. It didn’t work. 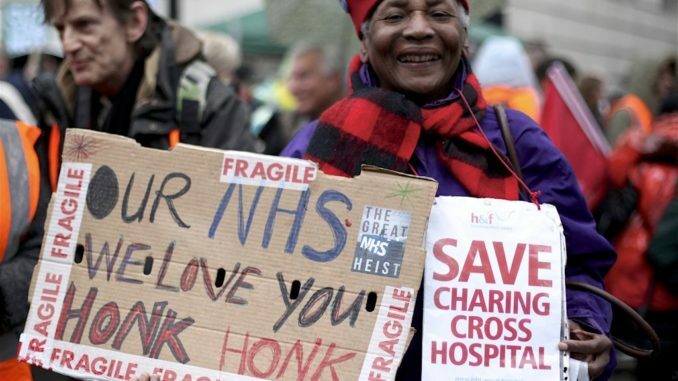 Save Our Hospitals H&F have announced a celebration outside Charring Cross Hospital at 3pm today (27/3/2019), get down if you can! Keep Our NHS Public is proud of it’s record in fighting cuts, closures and privatisation, as this news clearly shows, our work can and does have a huge impact. 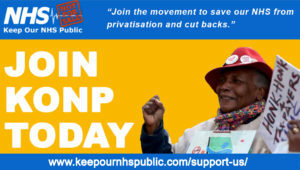 If you want to get involved with the campaigns to save lives, livelihoods, communities and the public service we all value so much, join us today. We salute you in your 7 year long campaign as Defend Dorset NHS continue to campaign against the closure of Maternity, A&E and Pediatrics at Poole Hospital. The Government and Clinical Commissioning Groups must be held to account for their irresponsible actions in downgrading the standards of care for people in this country. Money is not a God and people deserve to be cared for and protected by their Government. Well done, you are inspirational. So can the NHS demand a refund from the companies who formulated the misnamed Shaping a Healthier Future many of whom are currently working with STPs across the country at great expense to the taxpayer. Congratulations to the campaigners for their perseverance and stamina in what at times must have felt like a hopeless cause. Well done. Ideally, you may want to choose a licensed broker.